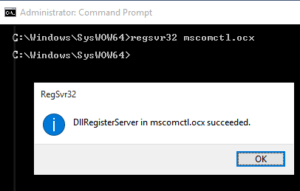 MSCOMCTL.OCX is part of Visual Basic 6 Package and you can download directly from Microsoft HERE then extract it using a tool like 7 Zip. Alternately you can just download the MSCOMCTL.OCX directly from us HERE. Thank you for reminding me of how to do this. It has been a while since I have had to do this and my memory is not what it used to be. Again, THANK YOU. Great tutorial as a non IT expert I struggle a little bit to open the CMD as administrator then to change the directory, in order to improve it, I would sugest you to explain to the user how to open the CMD as administrator and after that explain that they need to type cd C:\WINDOWS\SYSWOW64 in order to chahe it form the default C:\WINDOWS\SYSTEM32) after we managed to open the CMD as administrator. Is just my personal recommendation; Im really thankful beacause based on your tutoril I managed to fix my problem and now the program that I need to see open correctly. Great, worked with the app that required it! Thank you! Thank you Ian, it worked, anyway to trust 100% I want to try on some programs.